If you have kids (or chew lots of gum yourself around the house), chances are you’ve run into the problem of getting gum on your carpet. If you’re here, you may be trying to get gum out of your carpet, furniture or even your car carpet or upholstery. While chewing- and bubble-gum alike are ever popular habits to be carried out inside your mouth, there are times when it comes out (sometimes by accident!) and lands on your floor, and worse, carpeting. If the gum is stepped on and worked into the carpet fibers, you’re really in trouble. Getting it off can be a sticky situation whether it be fresh gum or old and dried chewing gum. Let’s take a look at how to get your carpet looking new again–and don’t worry, even if you’ve had a record gum bubble explode in your living room or car, there are ways to make it look like it never happened. The most common and reliable way to remove gum from your carpet is through the power of temperature. The first method we can look at is using cold. Since gum is chewed in your 98.6 degree mouth and you store it at room temperature, you probably don’t know what happens when it gets cold…really cold, to the point of freezing. Well, frozen gum like most anything in a frozen state gets very hard. In fact, when it gets frozen and hard, it doesn’t like that state and becomes brittle and falls a part. Ok, maybe there is no ‘they’ that says this, but it does describe the concept here. In other words, you need to freeze the gum in your carpet to the point it breaks into tiny little pieces. When the pieces are loose you can simply pick them up. Combing through the frozen with a rigid comb or brush can aid the breaking up process. Then, use a vacuum to help things further. The bristles rotating against it all and the suction can lends a helpful hand for sure. To freeze the gum out of your carpet grab a few ice cubes from the freezer and place them in a zip loc bag. Close and seal it tight to avoid leaking water as the ice melts. Place the ice bag directly on the gum in your carpet and wait 5-10 minutes. After this time, the gum should be frozen enough, and you can start breaking it out. If you want another option or you’ve tried unsuccessfully with freezing the gum out for whatever reason, you can go for the other temperature extreme: heat. Using heat can be a little more tricky since you don’t want to: a) melt your carpet or, b) much worse, start a fire. In the case of heat, your goal is really just to warm the gum back up again so it becomes pliable, a.k.a. sticky. In a warm sticky state, depending on the coverage of the gum in your carpet, the gum will stick to another surface that you can use to pull it away from your carpet fibers. For this, plastic works best. Gum will stick much better to a plastic bag or flexible wrap than it will your carpet when it is warm. Keep in mind that while this approach can remove lots of gum from your carpeting or furniture, it may not get it all out. As such, a combination of hot and cold might be your best way to remove gum. If you’re one of those folks that just wants to get a rag or cloth and try and remove things from your carpet like gum, then there’s hope. But what is the magic ‘solution’ to put ON this rag that will get the gum out and not damage your carpet? 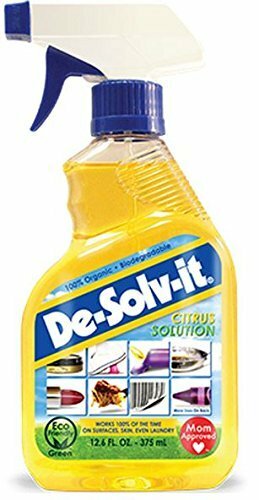 You might have used desolver products around the house to remove greasy, sticky or gooey residues. Well, these solutions can work for gunky gum on carpet too. You’ll want to work it in a little with an old brush. The gum should break apart for you to blot/vacuum up. Keep applying as necessary. If you’re using a chemical based product, work quickly as these cleaning solvents can break down your carpet fibers if on for a while. You can also try using a more natural product like the one pictured just above. This is eco-friendly and does the job for gum and many other adhesive residues as well as other types of old stubborn, stains. Smaller or hard to remove gum pieces can be lifted from your carpet by applying ointments like Tiger Balm or Ben Gay (the ones that smell heavily of menthol). When you’re done, wash and rinse with regular liquid soap. Dry the area thoroughly after rinsing. The next best thing to actually doing a new carpet install, is getting clean and looking like new again. If you have gum in your carpet in several places or you carpet overall is due for a steam cleaning, then you can get stubborn gum out of carpets with a carpet cleaning machine. It’s important that the machine uses hot water and is of high quality so that its suction is strong. Any professional carpet cleaner or company will have this equipment. Not only will you have gotten rid of the gum in your rugs, your carpet will be happy too.